Why Do Prices Vary from One Commercial Construction Company to Another? Bringing your commercial construction vision to life may leave you wondering, “Who is the right team to help bring my visions to reality?” With all of the different architects and construction companies out there, how do you know who to hire? While narrowing your list, consider asking each company for references, visiting their past construction projects, and interviewing them to ensure you’d work well together. These preemptive steps will pare down the list and leave you with a handful of options. Price is not often a good indicator of which construction company is best to bring your vision to life. While the temptation is to choose a company based upon a number, there are many more critical factors to consider. Then, of course, the next question we often hear from clients is, “How can construction prices vary so much in the same area?” Truthfully, the answer is often much easier than you think: you get what you pay for. For many clients, there’s something magnetic about the lowest bid. Especially when it’s significantly lower than the others. But there’s one thing to keep in mind in this process: the proverbial “bricks and mortar” costs from builder to builder is roughly the same amount of money to actually construct a new commercial space. The lowest bid, however, often leaves very little wiggle room for changes or mistakes. This risk-shifting technique from builder to owner means you bear the burden of not getting the end product you want or paying more money than you planned because of change orders. One of the greatest sources of change orders is the hand-off from architect to contractor. Blueprints are rarely perfect because field conditions invariably contain surprises requiring problem solving on the fly. Fluidity between engineers, architects, and builder can make all the difference in speed, quality, and pricing. Problem churn and related liability matters between the consulting professionals cost you time, unbudgeted dollars, and stress. When the finger pointing starts happening, the professional may come to you to tell them what path to take. Now you’re making key decisions without the benefit of being a construction company industry expert. At the opposite end of the spectrum, don’t hire the most expensive company just because they charge the most. Do your due diligence, run the numbers and ensure you’re getting the best product for your investment. Ask about change orders, risk sharing, and decision-making. So, why does picking your builder ahead of a bid provide you with the best/lowest overall cost? This chart illustrates why when you select your firm first they receive the most bids and ultimately provide you with the best price. Let’s say you have 3 construction firms you’re are considering, and you want all three firms to provide you a bid. We’ll label these firms A, B, and C. Each general contractor (A, B, & C) will request bids from subcontractors to create their bid for your project. However, not all subcontractors bid the same general contractors and some subcontractors provide better pricing to general contractors. Below is an illustration of just a few subcontractor bid disciplines. 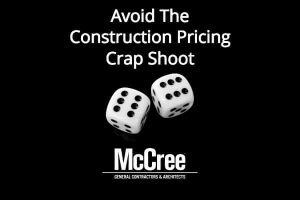 See below why you don’t get the best price possible because you decided to bid the project verses selecting one general contractor or design-build firm to complete the project. If you want to ensure you have the lowest bid, select your Design-Build firm first. Because they have been hired by you, the customer, they will receive bids from all subcontractors with no variation. Because of this model, the subcontractors will provide their very best price in order to win the work. The following table illustrates how they received the lowest price in comparison to the chart where 3 general contractors (A, B, and C) received bids. At McCree Construction we proudly specialize in what we call our Enhanced Design-Build method. This one point of contact style simplifies your experience and nails down the budget. In enhanced design-building, our team manages your project every step of the way and we, the professionals, bear the brunt of the construction risk. Our in-house architects and engineers work directly with our builders to ensure that you get exactly what you need, minimizing costly delays on the front-end, stress throughout, and all but eliminating construction-related change orders. When receiving a quote for enhanced design-build services you’re looking at the cost of dozens of in-house services bundled together for your convenience. Our promise of Designed & Built Right® translates into a win-win experience for all.When planning your new commercial building, and choosing a construction company to partner with you, it’s most important that you know what is and isn’t included in the price. Costs may vary from company to company, but getting the end result you want at a cost you budgeted is the end result you deserve. For more information about taking advantage of our Enhanced Design-Build services, contact us today.